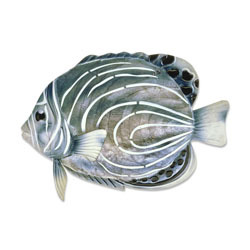 As many things in nature, the Koran Angelfish changes as it matures. As a juvenile, it is known to have white semi-circle lines on a striking blue body. But few things in nature are a solid color, and the artist recognized that as well. Using different techniques, up close, one can see the different shades of blue. The scales of the Angelfish are enhanced by using capiz shell throughout the body of the fish, so when one hangs this fish up it will reflect and bounce the light in different ways. The basic frame of the wall fish is created using tin, which is powder coated as a black finish. The frame is reinforced using wrought iron wire along the inner edge. Capiz is an oyster shell and the primary purpose of the oyster is as a source of food. However, the by-product, the shell, can be used for decoration. Due to it being a natural material, the natural colors of the capiz can come through as tans and browns underneath the paint.